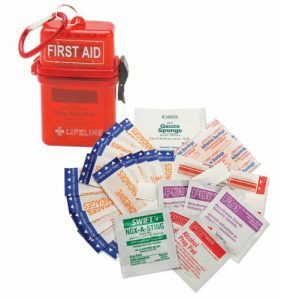 Before getting into the necessary essentials needed in first aid kits, let’s first talk about knowing what to do. 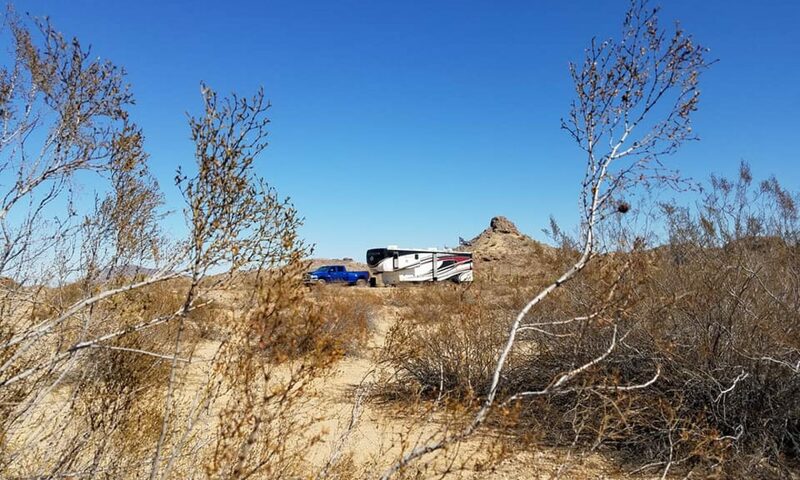 Regardless of where you are, in an RV, boat, the woods or the water, everyone should certify by taking the American Red Cross First Aid Course. 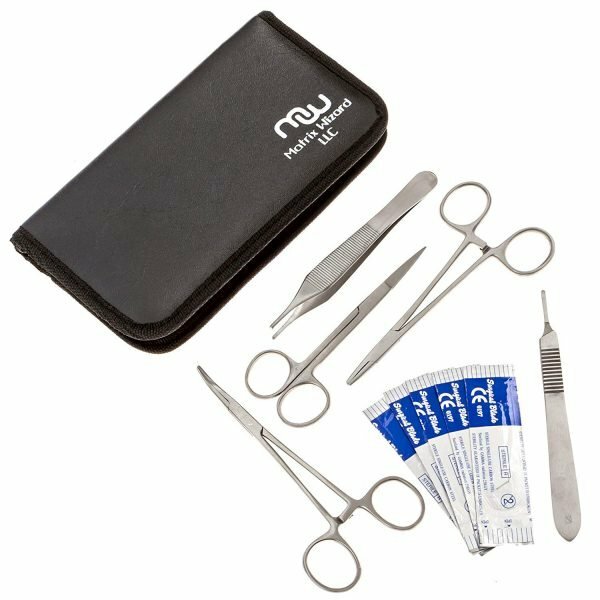 You’ll how and care for and treat minor sprains, wounds and injuries. If they are more severe, proper triage will buy precious time until you can get to a medical facility. Also, it would be wise to get (re)certified in an American Red Cross CPR Course for both children and adults. You may very well be the only one available to save a life or render aid to the injured. 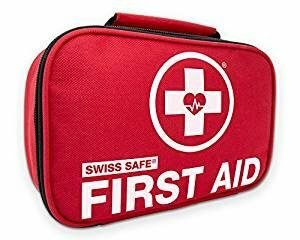 Having the right first aid supplies in your kit is job one. Its also necessary to know what supplies are used for each injury. 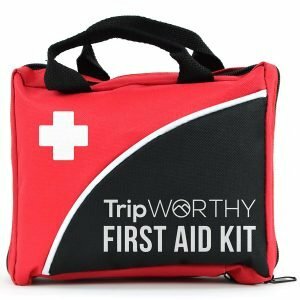 Putting together your own first aid kit is easy. Get your family involved in shopping and packing it. Its a good idea to keep a detailed inventory list so you don’t forget anything. We always recommend though, keeping first aid kit contents, especially sharp scissors and tools, OTC’s and prescriptions away from young children. Everyone, regardless of age should be properly trained on how to use the tools and supplies. I also recommend putting your physician’s contact information inside the kit. Here, we’ve provided some of the basics. 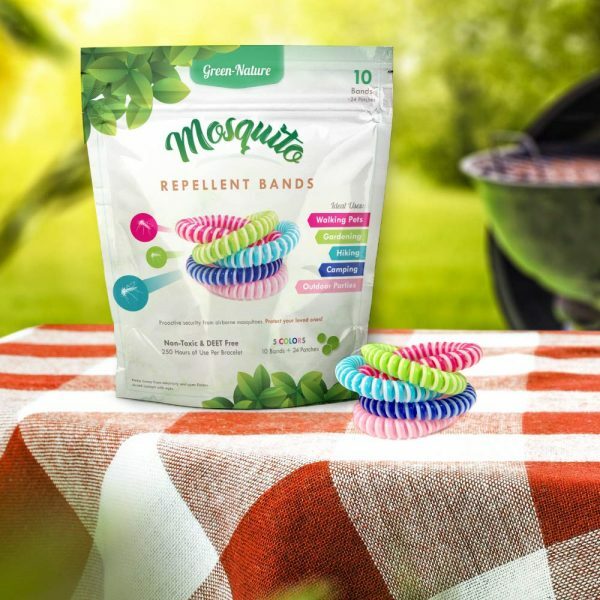 You may add other supplies as they are pertinent to the environment or activities you’ll doing. Always keep your tools clean, sharp and dry. Replace as needed. You certainly can mitigate some injuries before they happen (i.e. 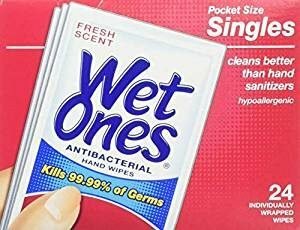 sunburn, blisters, infections, bug bites, etc.) by including preventative care and health maintenance supplies separately but with your first aid kit. Where can I get a first aid kit? Depending on size, each first aid kit has pretty much the same contents. 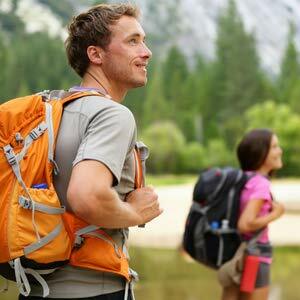 Don’t forget to buy accordingly; relating to the activity and location where you will be camping. For example, if you’re a hiker in rattlesnake country, you’ll want to include a snake bite kit and blister care kit. If you’re a day hiker or backcountry backpacker, perhaps adding in splint rolls or two with extra elastic bandage wraps. And if you’re into water sports or activities (i.e. swimming, kayaking, boating, fishing, etc. ), stocking your first aid kit with topical antiseptic cleaners, waterproof bandages, wraps and tapes are a good idea. 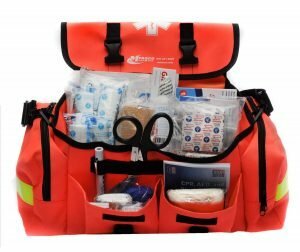 Or, you can purchase a first aid kit like below that is designed specific for water activities. 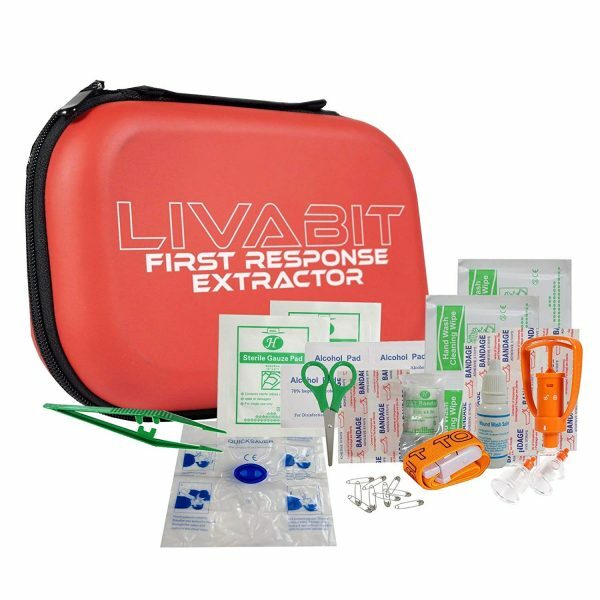 You can buy pre-made first aid kits online, at most big box stores, pharmacies and even camping stores. They range in prices from five dollars to one hundred dollars; depending on how large they are and contents. 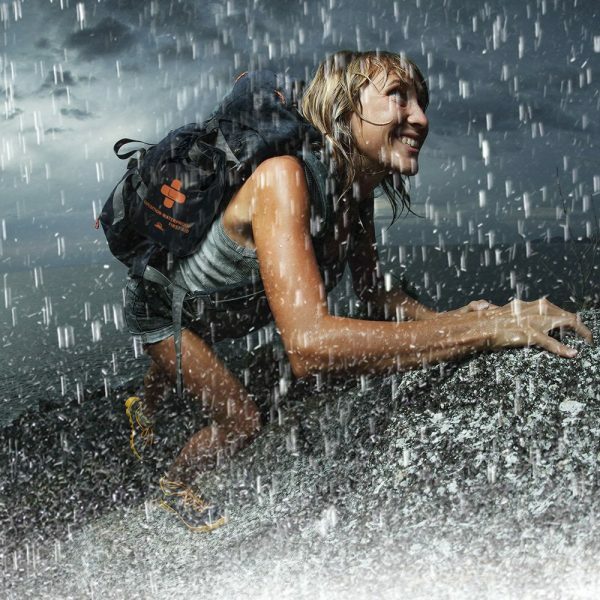 You can also purchase pre-stocked kits that are designed for specific activities, such as hiking, camping or boating like I mentioned above. Or, you can make your own designed specifically to your family’s needs. Whether you buy one already pre-stocked or assemble your own, make certain it has all the contents you may need. Restock when necessary and make sure you keep track of expiration dates. A good rule of thumb is ‘if you open it or use it, replace it’. In closing, the important thing is to be be prepared for what ‘could’ happen on the road or away from home. Always stay calm and keep your injured calm. 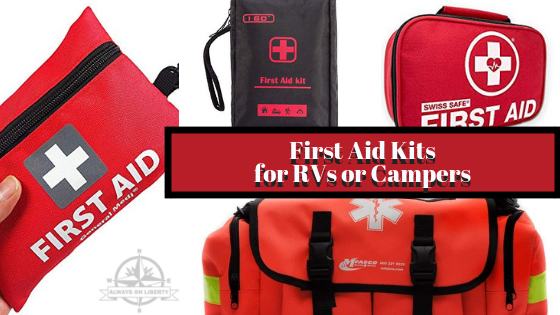 Having the first aid essentials necessary to mitigate further or more complex injuries will allow you to continue enjoying your RV or camping excursions. All content found on our blog, including text, images, audio, or other formats were created for informational purposes only. Offerings for continuing education credits are clearly identified and the appropriate target audience is identified. The Content is not intended to be a substitute for professional medical advice, diagnosis, or treatment. Always seek the advice of your physician or other qualified health provider with any questions you may have regarding a medical condition. Never disregard professional medical advice or delay in seeking it because of something you have read on this blog. This blog post may contain health or medical related materials. Links to content not created by Always On Liberty are taken at your own risk. We are not responsible for the claims of products or external websites and education companies.